Suppose I tell you something costs. $100 million dollars. Could be anything. Let's assume it's some technological item. Something that improves over time and it gets easier and less costly to build. A massive supercomputer. A satellite. Something like that. It's now 10 years later. How much does it cost? Suppose the technology improves drastically. A 50% reduction in cost per year. Compounded. At the end of the decade it would cost $100,000. 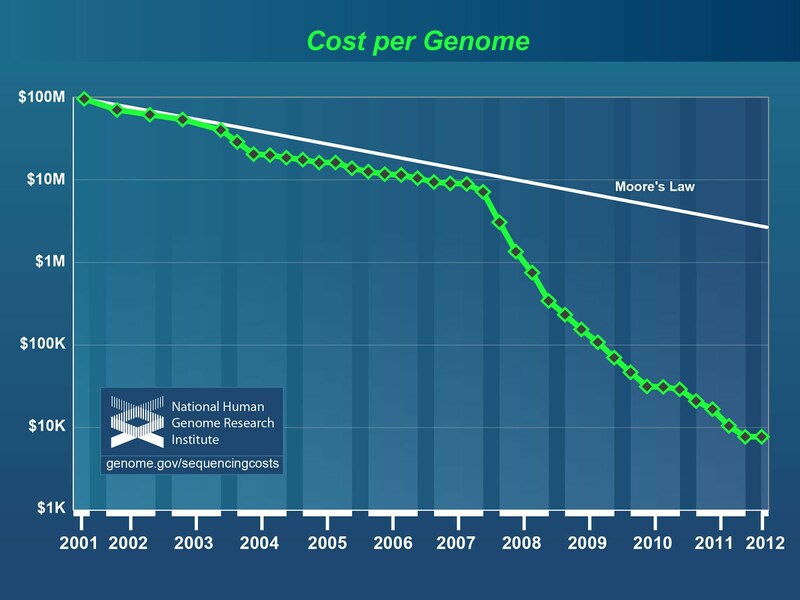 This still underestimates the decrease in genome sequencing costs. Check out this chart. What cost $100m in 2001 costs around $9,000 in 2011. Incredible. Anyone who has read Kurzweill knows that all of his predictions are predicated on a Moore's Law drop in technology cost per performance. But even this accelerated more quickly than expected. What I don't know is what happened in 2007 to accelerate this drop. I've literally never seen a chart like this before. Most technology improvements like CPUs, hard drives, solar cells, etc. are all fairly linear with a few small bumps along the road. I'd love to know what innovation occurred at that time and how it led to a continued drop in cost. 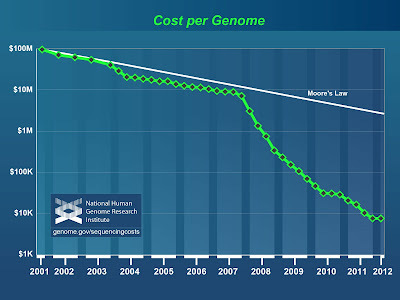 Also interesting would be the chart of how long it takes to sequence an entire human genome. I'm sure that's dramatic as well.